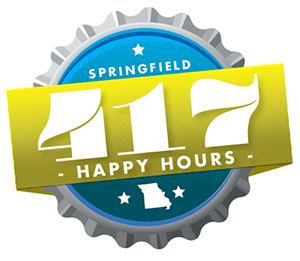 417happyhours.com is dedicated to helping those in the Ozarks drink on the cheap. That is it, that is all. We occasionally host events that have amazing drink specials, a really good time, and great people. Check out our One Beer Wednesday page to find out where that might be, please. SIDEBAR: Yes, right now this site is very quick and dirty. We need help to get accurate info, PRO-TIPS and the like, so that we can all have a great time and not go broke doing it. Click the “Help” category and see where you can help us out. We’ll buy you a beer, at least. Reach out to us via e-mail at help@417happyhours.com, comment on the post, or hit us at one of the social media outlets below. DISCLAIMER: Because we are, and likely always will be a quick and dirty source, some of this information MIGHT NOT BE exactly accurate. We do everything in our power to work with good people to get good information but GOSH DARN-IT we can’t make guarantees on this. That being said, we love our bars in 417 and don’t hold them accountable for our mistakes. Let us know, we’ll fix it, and we’ll treat you. Check us out on Facebook, Twitter, Instagram, and Vine.